It’s entirely possible that the clerk who ripped the pages out of the 15th book of Roman Catholic liturgical music was just old enough to have attended church services in pre-Reformation England, but in truth we don’t know. These parchment leaves, MS 12/6-7, contain parts of masses for Christmas Day and the Feast of St Stephen (26th December), the first Christian martyr. 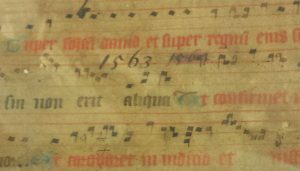 They are two fragments from a Gradual, a volume includes the music and words for the sung parts of services, but omits the spoken parts. The complete parchment volume must have looked impressive. Scribes used a variety of red, blue and black inks and decorative initial letters throughout. Time-consuming and expensive as it was to create, it was not just intended to look impressive: it an ecclesiastical service book designed to be used. Each initial letter being different is an easy and practical way to help people find their place at a glance during the service. It could have been sung from for many years before the Reformation and establishment of the Church of England in the early 16th century rendered Catholic liturgical manuscripts at best obsolete and at worst dangerous to possess. The physical documents themselves can tell us that these pages were written in England and that they date from sometime in the 15th century, but very little else, and nothing much is known of what happened to the Gradual or its composite pages over the next 500 years until these fragments were given to the University library in the early 1930s. The probably survived because they were among a collection of 15 random pages from various ecclesiastical volumes that were recycled into the bindings covering later, secular, books, including one of Leicester wills from 1563-1576. The skin and ink on what was presumably the inner side was generally protected and is still clean and vibrant. The other side is stained darker from handling and exposure to the environment, although the text and notation are quite legible.The creases and holes at what would have been the edges of the binding are evidence of its former use, as is this date scrawled across the stave, although the book of wills has long since vanished. 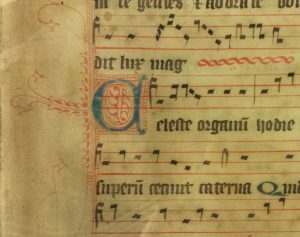 It is unlikely that this will ever be reunited with the rest of the Gradual or used in church on Christmas Day, and so it has had a third lease of life: carefully preserved amongst our collections and brought out on special occasions to scholars and the public. 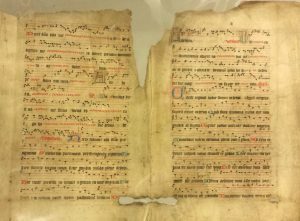 People are always thrilled at seeing a rare medieval manuscript, which would probably come as a surprise to the clerk who saw it as nothing more than a piece of scrap parchment suitable only for use as a cover for more important records. Manuscripts & Special Collections will be closed from 23rd December for Christmas and New Year, and re-opens on 3rd January 2018.